Quantum USVI Sail Loft has been in business for over 20 years, and they have recently relocated to 9B Remainder, Contant (five minutes from Crown Bay Marina) near Subbase. They are agents for Quantum Sails and make awnings and heavily reinforced stacking sail covers. The business also sells and repairs sails of all sizes, up to the largest of superyachts. Creative Canvas has new owners and is under new management. In keeping with the tradition and reputation of the company, the crew will ensure personal attention is given to each customers job by every employee, most of whom have been with the company for over 24 years. 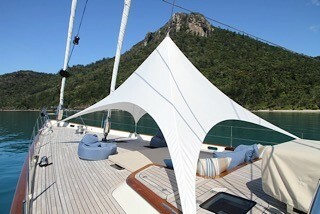 Vladimir and his crew are able to meet your yachts every need using top quality fabrics and PTFE thread.